HONG KONG, 7 September, 2015 – Starstreet Gourmet & Wine Walk, sponsored by Swire Properties Limited and developed by SCMP Marketing Solutions, will turn the Star Street neighbourhood into a definitive gastronomic and lifestyle destination. From 2-6pm on October 17 2015 (Saturday), Starstreet Precinct — the area around Three Pacific Place in Wan Chai — will be vibrantly festooned with festivity. Thirty-seven F&B establishments and lifestyle boutiques there are in full swing getting ready to welcome ticket-holders with a variety of gourmet dishes and an extensive collection of fine wine. Revelers should also get ready to indulge in live music, themed cotton candy, fun games and much more. Starstreet Gourmet & Wine Walk, powered by SCMP Marketing Solutions for the sixth consecutive year, has expanded its scope with a smartphone platform that enables ticket-holders to register and redeem offers from selected participating outlets. They can also enter a photo contest via the mobile site to win fabulous prizes, including travel coupons sponsored by Swire Travel. 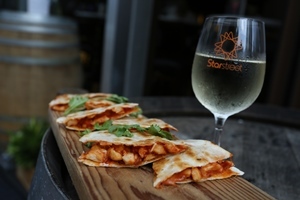 Along the theme of “#BeAStarian”, Starstreet Gourmet & Wine Walk is the must-go weekend event for all the influencers, artists, foodies and fashionistas who share Star Street’s unique cultural mores. First published in 1903, the newspaper has developed an enviable reputation for authoritative, influential and independent reporting on Hong Kong, China and the rest of Asia. Available in print, mobile, tablets and online through scmp.com and e-reader editions, South China Morning Post reaches a global audience with daily breaking news, analysis and opinion, multimedia articles and interactive forums. The South China Morning Post received over 160 awards in 2014-15 for excellence in editorial, marketing and technical capabilities. Other titles in the Group include the Sunday Morning Post, Nanzao.com (南早.com), Nanzaozhinan.com (南早香港指南.com), STYLE, Destination Macau, The PEAK, HK Magazine, The List and Where Hong Kong.